On June 30th, I along with other distinguished "Wheel of Fortune" alumni from "Buy A Vowel" Boards will be hosting a special event to raise funds for sick kids for Texas Children's Hospital. "Buy A Vowel" Boards and I will be hosting a special Wheel of Fortune tournament in Salado, Texas featuring a full size replica wheel and puzzle board built by Wheel alum and Salado native Clayton Capps. For fans of the show, this will be the closest thing towards being an actual contestant on the show. 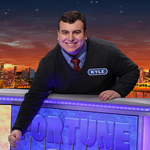 Members of the audience will have the chance to play America's Game with actual former contestants from the show in a chance to play for FICTIONAL cash and prizes. Bring out the entire family for a day of entertainment and laughs. During that time we will hold raffles so that you, that's right...YOU will have a chance to win special prizes including autographs and even tickets to a future taping of Wheel of Fortune in Los Angeles. OH YEAH! This event will also be live-streamed on Twitch.tv so keep an eye out over the coming weeks for updates. Here is the link to our donation page. 100% of the donations go to Texas Children's Hospital. TOGETHER we will make a difference for sick kids! We are also looking for local volunteers who would like to help us out during the event. If interested, send me a PM through here. Sounds like fun. I strongly doubt I'll be able to head down there, thoe, but I'll try and watch on Twitch. I hope you realize that Salado, TX is a tinyass town in the middle of nowhere, an hour away from the nearest major airport and hotels. Good luck getting an Uber to take you there. While the idea is good, and I certainly stand behind it, this whole thing seems very poorly planned. A venue in a place people can more easily get to (and possibly coordinated with major events such as TCONA where people will actually be anyways) would be a much better idea. As such, as it stands now, Jess and I can't really back this the way you want us to. Let's talk some more before going any further.